The Mary Kay Ash Story . . . In the business world dominated by men, here was one great lady who found a niche to stand tall among them. It’s timely with the coming of Mothers day to pay tribute to her memory in establishing Mary Kay Cosmetics as a great corporation churning out an annual sales volume in excess of two billion in 37 countries with 800,000 independent operators. This is the kind of story befitting the honour of all the women in the world in view of the coming Mothers Day on Sunday, 9 May 2010. Mary Kay Inc. is a brand of skincare and color cosmetics founded by Mary Kay Ash (1916-2001) who parlayed her early training in direct sales into a multi-million-dollar based in Dallas. Richard Rogers, her son, is Chairman and CEO. 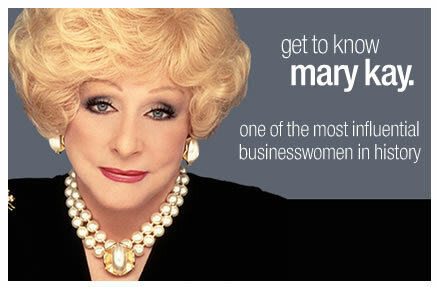 Mary Kay Ash banged her head on the corporate glass ceiling one too many times. Working for several direct sales companies from the 1930’s until the early 1960’s, she achieved considerable success. She climbed the corporate ladder to become the sole woman on the board of directors of the World Gift Company – quite an accomplishment for a woman in the 1950’s. Since the sales force was almost entirely female, Mary Kay thought that thinking like a woman was an asset. But her fellow board members disagreed. Finally, in frustration, she retired in 1963, intending to write a book to assist women in the male-dominated business. Sitting at her kitchen table, she made two lists: one list was all the good things she had seen in the companies where she’d worked, and the other list was all the things she thought could be improved. As she re-read her lists, she realised that what she had in front of her was a marketing plan for her ideal company. In just four weeks, her “book” had become a business plan, and her retirement was over. Both her accountant and her attorney did their best to discourage her, warning that she would be throwing her money away on this venture. But Mary Kay had heard enough male nay-saying in her corporate years – she ignored her advisors. Her husband, unlike her accountant and attorney, was very supportive. With his help, Mary Kay developed the cosmetic products, designed packaging, wrote promotional materials and recruited and trained her female sales force. Then the unthinkable happened; her husband of twenty-one years died of a heart attack. Another woman might have dropped her plans, or at least delayed them, but Mary Kay was a strong Texas woman. She stayed on track with the help of her twenty-year-old son, Richard Rogers and rolled out her new business in September of 1963. Beginning with a storefront in Dallas and an investment of $5,000, Mary Kay Cosmetics earned close to $200,000 in its first year – quadrupling that amount in its second year. When Mary Kay took her company public in 1968, sales had climbed to more than $10 million. Mary Kay’s unusual corporate motto, “God first, family second, career third,” was unconventional, to say the least. But she understood the need for women to have balance in their lives, and she was committed to providing unlimited opportunity for women’s financial AND personal success. Mary Kay authored three books, all of which became best-sellers. Her business model is taught at the Harvard Business School. She received many honours, including the Horatio Alger Award. Fortune magazine has named Mary Kay Cosmetics as one of the Ten Best Companies for Women, as well as one of The 100 Best Companies to Work for in America. At the time of her death in 2001, Mary Kay Cosmetics had 800,000 independent beauty consultants in 37 countries, with total annual sales of over two billion dollars. Never underestimate the power of a woman with a mission! Who can say that women cannot be business leaders? Wonderful. I recently purchased makeup remover from this brand as well! Good for Mary Kay.